Skift, the online travel newsletter, reported recently on one area where the USA enjoys a considerable trade advantage with China: far more Chinese travellers visit the USA than vice versa and that disparity is growing. Over the past decade US tourism to China has only grown at one percent per annum. It’s the same story with Western Europe and China. Skift puts it down to a number of factors including the ‘airpocalypse’ pollution which regularly blankets Beijing and other big cities – in fact much of China. Then there’s a reputation for language difficulties and a less than welcoming tourism environment – which is not reality from my experience. And visa hassles – which indeed are a problem. Although visa free entries are now available for short visits to certain cities the general Visa story is complicated, time consuming, confusing and expensive. In general China visa offices try to insist that you have proof of inbound and outbound flight bookings before they will issue you a visa. This is particularly annoying when China has more land borders than any other country on earth – 16 of them! Over the years I had entered or left China by seven of those borders: Hong Kong, Macau, Vietnam, Nepal, Pakistan, Mongolia and North Korea. I’ve come across those borders by bus (Macau, Hong Kong, Pakistan), train (Hong Kong again, Mongolia, North Korea) and on foot (Macau again, Vietnam, Nepal). The Daily Telegraph in London recently ran an article on China’s 16 borders and other countries which also feature lots of borders. Number one in Western Europe? Germany which borders nine other countries although France and Austria are close behind with eight. 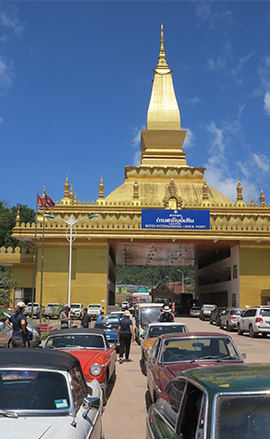 ◄ This year I added two more China border crossings to my list, on my Silk Road MGB trip we crossed the border from Luang Namtha in Laos to Mengla in China. 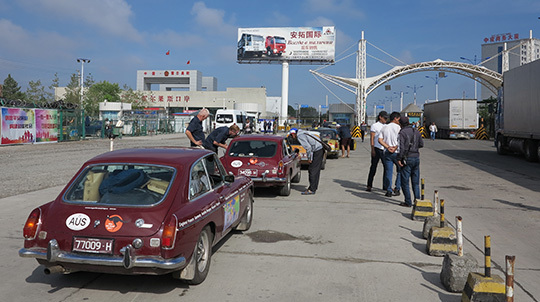 ▲ A month and a half later we left China from Horgas in Xinjiang Province, crossing into Kazakhstan. That’s my car at the back of the line. ▲ And here we are just across the border into Kazakhstan with some cyclists also departing China. Already we’re encountering the potholes that will be part of the story all the way across the ex-Soviet ‘stans – Kazakhstan, Kyrgyzstan, Uzbekistan and Turkmenistan. Although the story wasn’t consistent, at times the roads were fine, there were stretches of appallingly potholed roads in each country. So we weren’t flying into or out of China what do you do? Show the visa office your flight bookings and then, once you’ve got the visa, cancel them of course. China hasn’t presented my only visa hassles during 2017, I had to get a new Australian passport in order to visit Iran because the old one sported an Israeli stamp. Yes, I know the Israelis will stamp a separate removeable piece of paper rather than your passport itself, but not if you come in from Jordan via the West Bank, Occupied Palestine or whatever you want to call it. Of course having visited Iran I then had to get a US visa because an Iran visit (ditto for my visit to Sudan last year) disqualified me from using an ESTA (Electronic System for Travel Authorization) for the USA. More on that after my planned November trip to San Francisco.